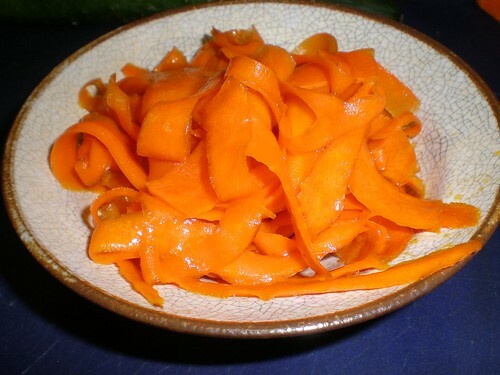 I like carrot kinpira, but I got the idea for carrot ribbons from one of my favourite okowa shops near where I live - they use the carrot ribbons to fill in the gaps of their bento, and I think they're more efficient at for this than carrot matchsticks. Basically, I just used a carrot peeler to make long ribbons from a carrot, and then simmered them in about a tablespoon each of sake, sesame oil, and mirin, as per Maki's recipe. That's a great idea, and much faster than kinpira to make I imagine! Oh, I hadn't though of that - but now that you mention it - it was. I have my own way of doing carrots that's similar to kinpira too - I like to steam the carrots, then dress them with a little sesame oil and some toasted sesame seeds. It's slower, but I like that it takes so little oil. And I steam most of my vegetables too - I don't have to pay so much attention to them and can do something else while they cook! Thanks for posting your recipe, I'm going to try it next week! I made these for my bento tomorrow. I have dressed them with sesame and nigella seed after cooking. Yummy yummy! !